So how do we build vegetable gardens with soil dominated by bacteria while creating fungi-dominated soil around our trees? The first step is to start being more sophisticated about our mulch choices. Bacteria are good at breaking down what composters like to call "greens" --- grass clippings, food scraps, and even straw (since the grain was cut while it was still growing and full of sugars.) Bacteria also thrive on easy to digest manures. On the other hand, fungi shine when given "browns" --- fallen leaves, wood chips, and anything else full of lignin and hard for most other organisms to digest. The consistency and application method of the mulch matters too. Wet, finely ground mulch supports bacteria, even if the mulch consists of fallen leaves. On the other hand, dry mulch in big chunks will encourage fungi. 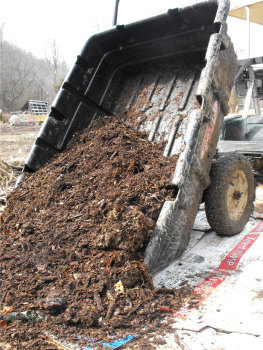 Any mulch that is worked into the soil will feed bacteria first, while mulch placed on the soil surface will feed fungi. So an optimal mulch for a vegetable or annual flower garden would probably consist of finely chopped, wet grass clippings. Under our trees, the best mulch would be big chunks of leaves or wood chips. Dreaming of spring chicks? Our homemade chicken waterer prevents drowning.